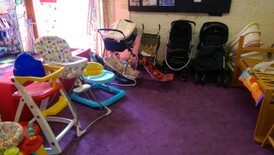 Baby's & children's clothing and equipment for those in need. If this is so, how many babies are missing out on other essentials ? How many children are missing out on clothing, toys etc ? After talking with a number of ‘care’ professionals we at Blackburn Vineyard Church saw that there was an opportunity to supply (free of charge) GOOD QUALITY / SECOND-HAND (and some new) baby equipment (eg cots, prams, high-seats etc) and children’s clothes; maternity wear; and toys / games / books - to families on low income. 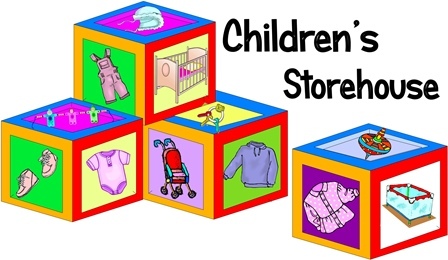 To meet this need we have established the CHILDREN’S STOREHOUSE. We started the store within a domestic garage, but soon outgrew that. But thanks to the Methodist Circuit and particularly St Paul’s Church, we were able to move our store to their basement. However, as this soon became to small to operate from we were able to find bigger and more suitable premises, closer to the Town centre (thanks to Blackburn with Darwen Town Council). The building needed lots of TLC, as it had not been used for many years; but thanks to a few hard-working volunteers, the place has been transformed to operate the Children's Storehouse. THE PROCESS is very simple – contact is made by the referrer via our Children’s Storehouse email or telephone. Arrangements are then be made for the family to visit the Storehouse and select the items that they need. We are always looking for VOLUNTEERS to help - so if you are interested, please do not hesitate to contact us for more information. or if you feel that you would like to support this ministry financially please click here and you will be taken to another page with details on how to donate. and a registered charity (No. 1150962). ‘VINEYARD’ is a European Union trade mark registered to Vineyard Churches UK & Ireland No. 004771143.
are all registered trade marks of Vineyard Churches UK & Ireland. Used here under license. All rights reserved.